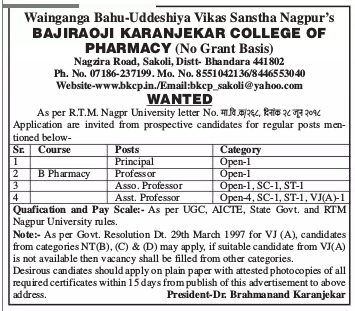 Bajiraoji Karanjekar College of Pharmacy, Bhandara has advertised in Loksatta newspaper for the recruitment of Professor/Associate Professor/Assistant Professor jobs vacancies. Interested and eligible job aspirants are requested to apply within 15 days. Check out further more details below. About College: The work of a pharmacy professional can take many forms and pharmacists may work with varying levels of responsibility and in different settings, including clinical practice, education, research and industry. These principles apply to all pharmacists, irrespective of whether they treat care for or interact directly with patients and the public. A pharmacist is professionally accountable for their practice, which means being responsible for what they do or do not do, no matter what advice or direction a manager or another professional gives them. A pharmacist may be faced with conflicting professional or legal responsibilities; therefore they must use their professional judgment when deciding on a course of action and should use their professional and ethical principles as a basis for making those decisions.